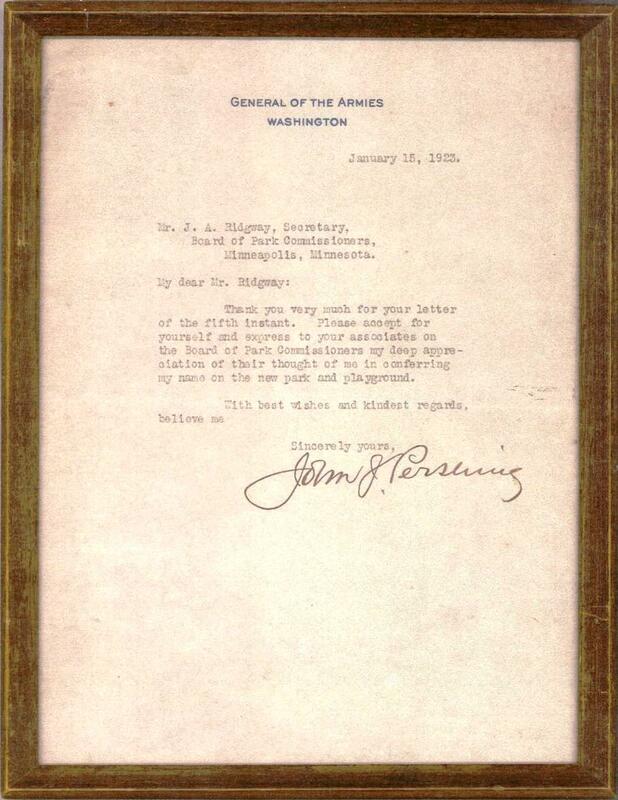 After the park board named a new park and playground in southwest Minneapolis, Pershing Field, December 5, 1922, it received a thank you note from the man it was named for—Gen. John J. Pershing. I have a low resolution photocopy of the letter, which is in the display case in the commissioners room at park board headquarters, and I sent a scan of it to the two people who were the first to answer a question I posed in a posting earlier this week. But it’s so cool I thought everyone should see it. One of the people I sent it to, Don Lehnhoff, provided this additional information on the letter—which makes it even cooler. “Pershing is the only person to be promoted in his own lifetime to the highest rank ever held in the United States Army—General of the Armies (a retroactive Congressional edict passed in 1976 promoted George Washington to the same rank but with higher seniority. )” Pershing holds the first United States officer service number (O-1). That’s pretty serious stuff, and puts him in pretty rarefied company … Pershing and G. Washington. Any way … many thanks for sharing that.